Earlier this month, the Chicago Mercantile Exchange (CME) announced they are collaborating with the Chicago Board Options Exchange (CBOE) to bring to market four new volatility indices which are scheduled to be launched in the third quarter of 2010. 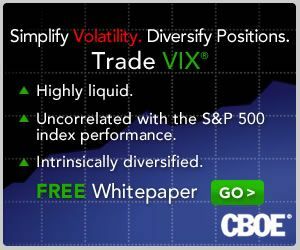 The CBOE will use the VIX methodology to calculate volatility indices for four commodities: crude oil; corn; soybeans; and gold. Personally, I find it difficult to disagree with DuFour’s assessment and am excited by the prospect of volatility indices being extended to the CME and commodities. Of course the CBOE has already rolled out two commodity-related volatility indices with the CBOE Crude Oil Volatility Index, also known as the “Oil VIX” (OVX) and the CBOE Gold Volatility Index, also known as the “Gold VIX” (GVX). Should the joint CME/CBOE volatility indices gain broad acceptance, I would not be surprised to see additional commodity-related volatility indices to follow.